We have spent a lifetime total of approximately three million hours playing video games where we destroy things and basically run around being insane. It’s a kind of therapy that lets us take out our frustrations on digital victims. But at some point, destroying pretend stuff ceases to be quite as satisfying. The people behind Drive a Tank get that – and they might just be our soul mates. 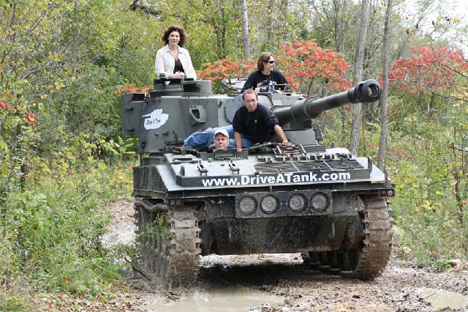 Drive a Tank is a service in Minnesota that lets you satisfy your innermost desires to drive around a wicked armored vehicle. For $499, you can drive two tanks around a wooded course and test fire some historic weapons. But for just $499 more you can use that mean machine for what it’s really meant for: crushing the life out of a poor, defenseless car. Add another $200 and you can crush a second car. As long as you’re throwing money at the Drive a Tank people, you can also reserve a helicopter taxi from Minneapolis/St. Paul to drop you at the tank range for a true rock star experience. 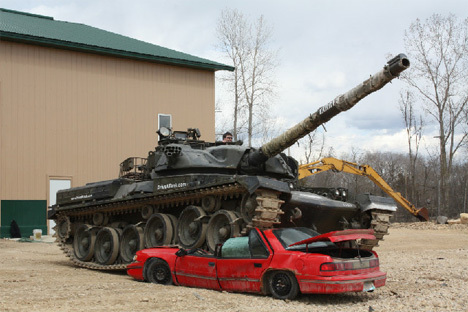 The operation seems to be reasonably safe, incorporating a two-hour tank training course and tandem “instructor” controls in the tank just in case you lose control. 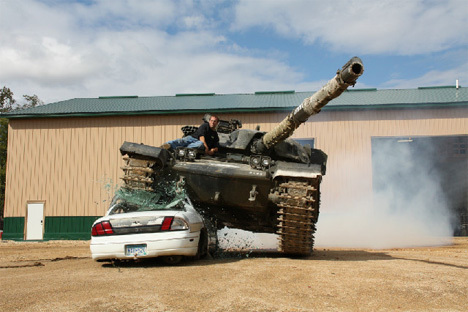 And our guess is that smashing cars with a tank is way more satisfying than those race car-driving experiences. See more in Mods & Custom or under Transportation. December, 2011.